Title: Flaubert: The Uses of Uncertainty Author: Jonathan Culler Series: Critical Studies in the Humanities Imprint: The Davies Group, Publishers soft cover 284 pp. USD 24.00 ISBN 978-1888570748 April 2006 Jonathan Culler’s Flaubert offers an introduction to the French novelist through perceptive and insightful readings of the entire body of his work. Rather than analyzing each of Flaubert’s novels as a unified artifact, the author has chosen to disperse and fragment them: to create from their fragments a context in which reading can take place. The first chapter, however, departs from this scheme, and, reading the juvenilia against the problems posed by Flaubert’s literary situation, seeks to extract a series of projects that lead an uneasy life in the later novels. The second chapter explores the ways in which the mature novels resist recuperation while at the same time inviting it, and sketches what might be called a pathology of the novel. The third chapter investigates what might qualify as two unifying concepts: Stupidity, a major category of Flaubert’s discourse, which brings about in formal terms the fragile co-existence of notions which have little common substance; and Irony, a central category in critical discussions, whose affirming and negating qualities offer the possibility of representing through it the complexities of Flaubert’s technique. Finally, the problem of reading towards a positive meaning is posed and explored through Salammbô and Trois Contes. 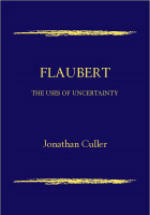 Culler offers a Conclusion in which he offers some retrospective justifications and explores the reasons Flaubert still interests and rewards modern readers. Contents Chronology Introduction 1. The Rites of Youth A. Precocious Boredom B. Narrative Strategies C. 'Beyond' Romanticism 2. The Perfect Crime: The Novel A. Opportunities B. Description and Meaning C. The Elusive Narrator D. Weak Vessels E. Thematic Indeterminacy 3. Values A. Stupidity B. Irony C. The Sentimental and the Sacred Conclusion Afterword Notes Bibliography Index Reviews of the earlier edition “Facile reading will not satisfy Jonathan Culler, whose brilliant Flaubert: The Uses of Uncertainty is destined to create a new critical approach to the novels … [He] develops his paradoxical arguments with dazzling expertise.” — The Yale Review “[There] are innumerable perceptive insights; the entire study is a model of methodology, always clearly stated and constantly submitted to challenge as needed…. This is a book to read, to ponder, to rage at, and to learn from.” — Modern Language Journal Author Jonathan Culler is Professor of English and Chair of the Department of English and Comparative Literature at Cornell University. Among his many prestigious publications are Framing the Sign: Criticism and Its Institutions; On Deconstruction: Theory and Criticism after Structuralism; ed., Deconstruction: Critical Concepts, 4 vols. ; On Deconstruction: Theory and Criticism after Structuralism; and Just Being Difficult? Academic Writing in the Public Arena, ed., with Kevin Lamb.